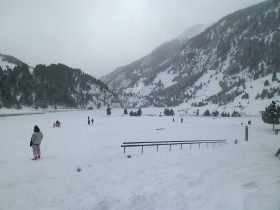 The nearest ski stations to the Costa Brava in the Pyrenees are Vallter 2000 (above Setcases) and Vall de Nuria, with larger ski resorts a little further away in La Molina and Massala near Puigcerda (on a train line from Barcelona) and further options up to Andorra. 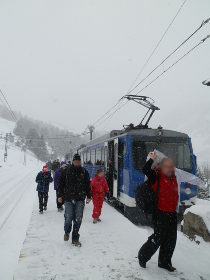 With snow arriving in the mountains we travelled up to Ribes de Freser to catch the Cremellera rank-and-pinion train up to the snow at Vall de Nuria - the only transportation link into the resort. Using the train means we don't have the risk of needing to drive in snow but can park at Ribes de Freser and let the train do the work through a spectacular climb up to Vall de Nuria. Our journey time to Ribes de Freser was about two hours with another 30 minutes for the train ride. 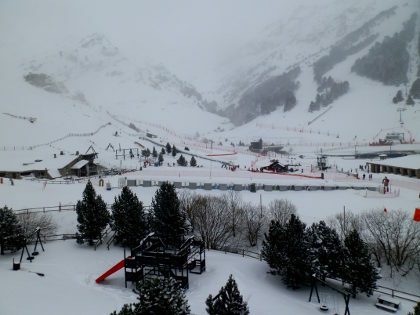 Vall de Nuria is not large - there are approximately 6-7km of pistes, around one third of which are blue runs but for beginners or those just wanting a taste of the snow it provides a startling contrast to a a day on the beach. 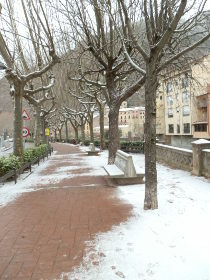 The train leaves from Ribes de Freser, a small Catalan mountain town on the road to Puigcerda. The stone of the buildings is more muted than the golden hues closer to the close giving the town a sense of rough hewn grit. Ribes actually has two stations for the Cremallera train - one on the outskirts that connects with trains from Barcelona, and a more central Estacio de la Vila in the heart of the town. We parked close to the tourist office which is near the first of the stations and then walked to the central station stretching our legs from the journey and revelling in the sugaring of snow. However, this little walk meant we missed the first train we could have caught so we had to wait for 40 minutes or so in the station as trains leave about every hour. If you want to minimise your travel time, keeping an eye on the train times will help with journey. The delay did mean we could properly find out what the options were for going up. From the station you can buy the Cremallera ticket which gives you the train ride and access to the main buildings at the top, or for a little bit more buy a Forfait or Skipass for all the lifts if you want to go skiing or snowboarding. Ski and Snowboard hire is done separately when you get to the top. An alternative for small children might be to get the ticket that includes the Parc Ludic - a snow park with slides and rubber ring sledges for younger children. We were travelling with a dog and weren't sure what the reaction was. We had read it was possible to take dogs and when we got there it was pretty obvious this is quite normal. The formal rules say dogs should be muzzled. Our dog is very passive and though we took a muzzle with us, we didn't have to use it. Bigger or more noisy or aggressive dogs might be different. The journey up takes about 30 minutes of steady climb - it's not express type of speeds, but there is a good amount of climb and spectacular scenery on the way with a small viaduct, cliffs, cuts through the rocks, gorges and dramatic mountain scenery. For us the train journey was worth the trip. We arrived at the train station at the top which is right next to the large almost barracks type building that acts as the centre for all the activities. The day we were visiting it was cold - around -7C and snowing, but with a gusting wind that created white-out snow flurries from time to time. So not the best day for photographs, but lots of fresh powder snow for skiing. The first thing was to get kitted out. There is a big and very efficient rental hall which means hiring skis, boards, boots and helmets was fast and painless. The only slight look-out is that you will need a passport or identity card for identification when making the hire. I'd left mine in the car at the bottom, so it was a good thing my better half had hers. For ski-ing there is a telecabin lift and a chair lift to the higher parts, and around the lower parts a small button lift. For beginners, the skiing starts from an almost flat green slope. For other skiers there are a number of blue runs, 2-3 red runs and one black run. Not really so much for more experienced skiers but possibly enough for the occasional one-a-year day out. So while our children went off for skiing we explored the lower area. The main building actually works very well if you're not skiing. There is a small cafe, a shop, a large restaurant and, very welcome for us given we had a dog with us, a large room for 'picnics' - basically somewhere warm to hang out without feeling that you have to buy something. 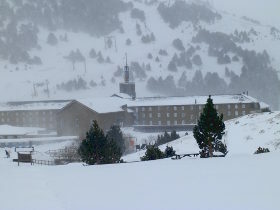 The rest of the building is partly hotel, partly church and sanctuary (Vall de Nuria has a history as a place of religious devotion), and partly museum. While not particularly exciting, the museum is interesting and helps set the scene for the history and ecology of the valley. Around the main building children were messing about on sledges. Unlike Switzerland or bigger ski resorts where there are often long specialist sledging tracks for free for those who don't want to ski, the areas for sledging were relatively small and really just for smaller children. The day of visiting, the snow was deep making walking difficult and it was bitterly cold and we didn't really want to get too far from the shelter of the main building. For summer walking there are routes down the valley all the way back to Ribes de Freser (marked as being 5h50) - the traditional pilgrims route. The end of the day for us came a little earlier than planned, partly because of the cold. Obviously for day trips you can try to pick and choose the day for visiting to both have snow and good weather. The train was efficient and ran on time and we worked out that from the time the train left at the top to getting home was about two and an half hours. Not bad for a little bit of winter wonderland.